Access All Areas members have an extensive collection of Illustrator Brushes to download this week, courtesy of Jeremy Child from The Artifex Forge. 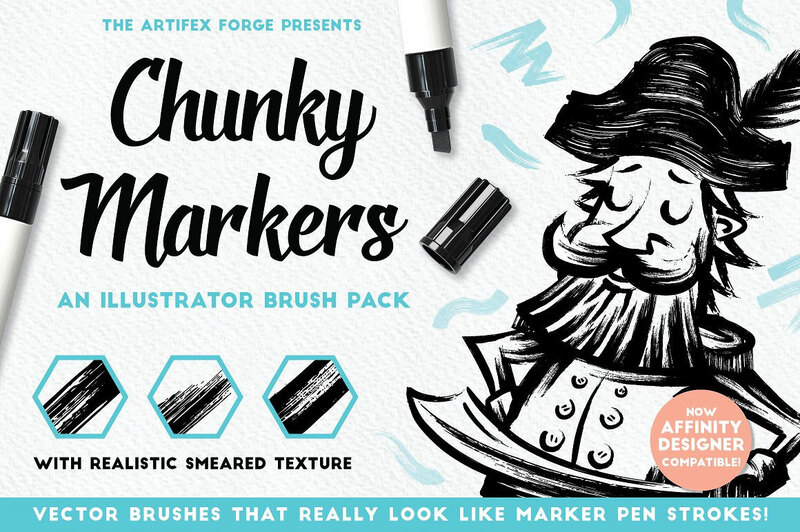 These vector marker pen brushes really capture the smear and swipe of the real thing, allowing you to create convincing marker pen artwork in Adobe Illustrator or Affinity Designer with ease. Over 300 real brush stroke samples were created and only the best ones were selected for this pack. Hours were spent testing different markers on varied surfaces to get the look just right, and the result is the most realistic looking vector marker set available. Jeremy Child supplies original illustrative design resources for Illustrator and Photoshop. In Latin, Artifex means ‘an artist, builder or maker of things’ or ‘ingenious and artistic’, which together with the idea of a forge as a workshop really sums up what he does – the creation of practical, useful and beautiful design and illustration tools (and ‘art effects’)! Check out his store or download download three free products here. This Illustrator brush pack contains 34 realistic marker pen brushes, all sampled from the real thing. These include: standard chunky markers, slanted, messy and thin brushes – perfect for a wide range of creative tasks. If you are a tablet user, you’ll be pleased to know that a version of the brushes with pressure sensitivity enabled is included. (Please note that this feature only works in Illustrator CS5+). A set of Affinity Designer compatible brushes is also included. These are bitmap brushes which work along a vector path using the brush tool. Oh, cool! Thanks, Jeremy! Thanks, Chris! Two of my favorites!